Aadhaar will be mandatory for applying and renewal of driving licence. It would become mandatory from April 2018 onwards. Aadhaar will also be the main proof of identity and address. The move comes in the wake of fraudulent ways being adopted by people to beat suspension of driving licences. People could get new driving licences from different RTOs in other states. The transport ministry has already created an online depository of 11.5 crore driving licences named "Sarathi". According to a random test done by the National Informatics Centre (NIC) in 2014, the total number of fake or duplicate driving licences in India was around 74 lakh. 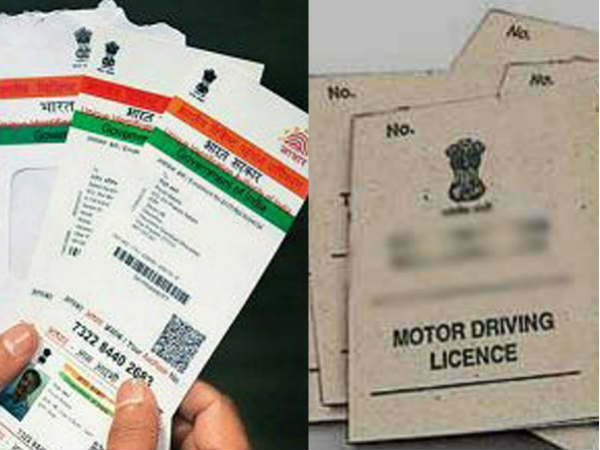 How to link Aadhaar with Driving Licence? Now select the ''Search Element'' as Registration number or License. Enter your Registration or License number selected Click on ''Get Details" icon and your vehicle details will be shown. Enter your 12 digits Aadhaar number with valid phone number Click on submit and confirmation message will be sent to your mobile number. By clearly following the above procedure you can link your Aadhaar card number with Driving license from any state Transport department official website's to link Driving License and vehicle Number. 1. First go to the website of your state road transport department. 2. Click on the support number entry on the website. 4. Then enter your registration number or license number. 5. Click on Get Details and your vehicle's table will be here. 6. You have been given a support number and mobile number column at the bottom. 7. Enter your support number and mobile number of 12 digits in it.